OXFORD, N.S. 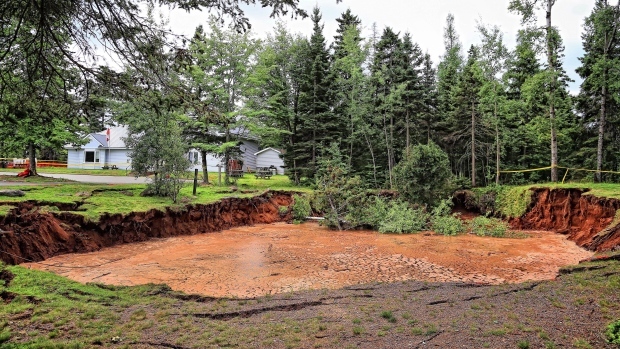 -- The spokeswoman for a small Nova Scotia town says there are "ongoing negotiations with geophysical and geotechnical firms" to have work completed at the site of a mysterious sinkhole that took a huge bite out of a local park over the summer. While there haven't been any significant changes to report, Oxford deputy clerk Linda Cloney says the water level at the sinkhole is now higher than the lake water around it, and it keeps swallowing small amounts of soil. The sinkhole first appeared in mid-July as a hole the size of a dinner plate, but has since grown to a size larger than 32.6 metres by 38.7 metres, swallowing up trees and picnic benches and drawing curious onlookers to the small town of about 1,000. While the growth has slowed for the most part, toward the end of September new cracks had appeared in the surrounding pavement. And last month, some more cracks appeared near the geological phenomenon, though no more were found in the parking lot. 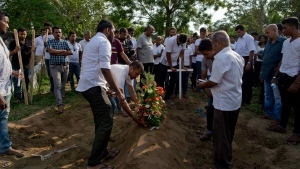 In a release at the time, emergency management officials said they had received a report on a ground penetrating radar survey of the site, but the depth of penetration was only one to five metres -- "not adequate to effectively model the bedrock geology beneath the thick layer of sand" in the park.